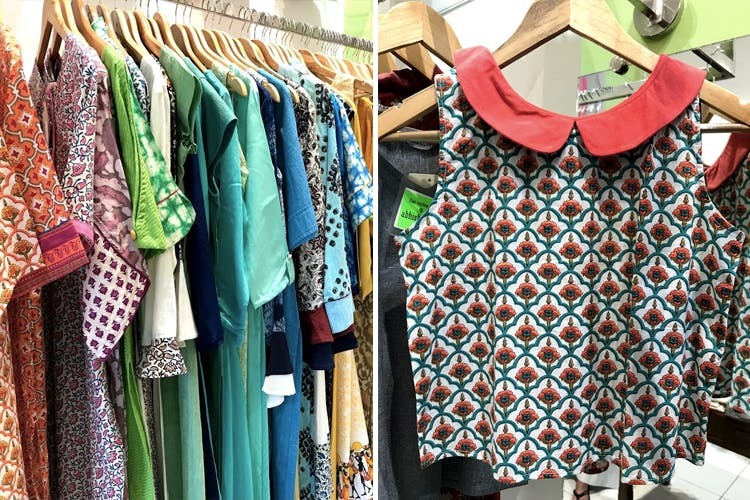 Abhishti is a boutique in Kamla Nagar Market that's got a bunch of pretty casual kurtis, printed palazzos, tunics, dresses and asymmetrical skirts too. For someone who loves ethnic clothes but can't afford Anokhi every other day, this store could be a good alternative. Tunics, ethnic cotton dresses, skirts, kurtas and wedding wear for smaller functions. Abhishti, a bright green-coloured store on the outside, opens up a whole world of comfy ethnic clothing. They've been around for almost four years, offering artsy clothes made by craftsmen from Benaras, Chennai, Bagru and from various other parts of India. Coming to their collection, it ranges from block-printed ethnic crop tops and simple kalamkari anarkalis to embroidered blouses and suit sets for dressy occasions. If you're someone who can't get enough of indigo and bagru prints, you'd want to fill your closet with Abhishti's tunics, flowy dresses and kurtis. We had our heart set on a full-sleeved indigo top (INR 899), but bought the cute, Peter Pan collar crop-top instead because at INR 499, it seemed like a better deal. They've also got pretty dupattas, skirts in solid colours and basic leggings that are perfect for someone who likes to mix and match ethnic outfits. For those who're too lazy to make the trek all the way to North Delhi, check out their website. They promise to deliver in 24 hours (within Delhi NCR). We'd have loved it if the prices of a few tunics and kurtis were lower. They're offering a 50% end of summer sale on pretty much everything, so there's no better time to drop by.